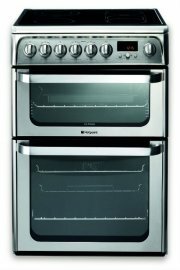 Hotpoint HUE62XS 60cm Wide Electric Cookers in Polar Stainless Steel with A Energy Efficiency Class. Also known as HUE62XS, HUE62X. Intelligent cooking - Ever wanted a top chef to give you their professional help and expertise? We?ve developed the next best thing? an easy to use feature that manages everything for you. From optimising oven elements, to recommending shelf position, temperature and cooking time. With the Intelligent Cooking System you can be confident that even the most ambitious dish will turn out beautifully. Catalytic Liners - Catalytic agents work with the heat of the oven to break down grease and excess fats leaving you with more time to cook rather than clean.